Discover a sprawling paradise where the foliage is so rich and luscious, with a veritable rainbow of flowering trees and plants, that it’s easy to escape the cares of the outside world. 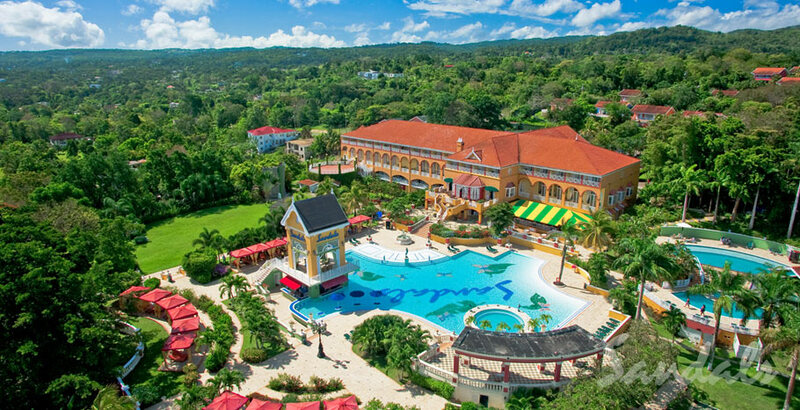 From a tranquil mountaintop to the white sand beach to the fairways of the championship golf course, this Ocho Rios resort and spa is surrounded by the incredible natural beauty of Jamaica. Spanning a luxuriant stretch of the Jamaican coastline, Sandals Grande Riviera is created to enchant you with two distinctive resort experiences in one. The Seaside & Ochi Beach Club is home to babbling brooks, fragrant gardens and the chicest beach club in Ocho Rios, where cool drinks and even cooler vibe are enjoyed at stylish beach party by day, and the hottest outdoor lounge in the Caribbean at night. Those seeking something a little more secluded will find just that in the tranquil Riviera Villas & Great House Suites. Set amidst the unforgettable beauty of the St. Ann Mountains, 93 villa pools and luxurious suites create an exclusive hideaway suited to private moments. At the foot of this mountain-side garden enclave is the plantation-style Great House, a bluff-top manor where people come to gather around the vast zero-entry pool, or in a sophisticated piano bar. Regardless of which side of the resort you choose, you’ll discover gourmet global cuisine at 15 exquisite restaurants and magnificent gardens. It all serves as a welcome reminder that, wherever you find yourself at this magnificent resort, it truly is the best of Jamaica. Learn more about Sandals Grande Riviera.